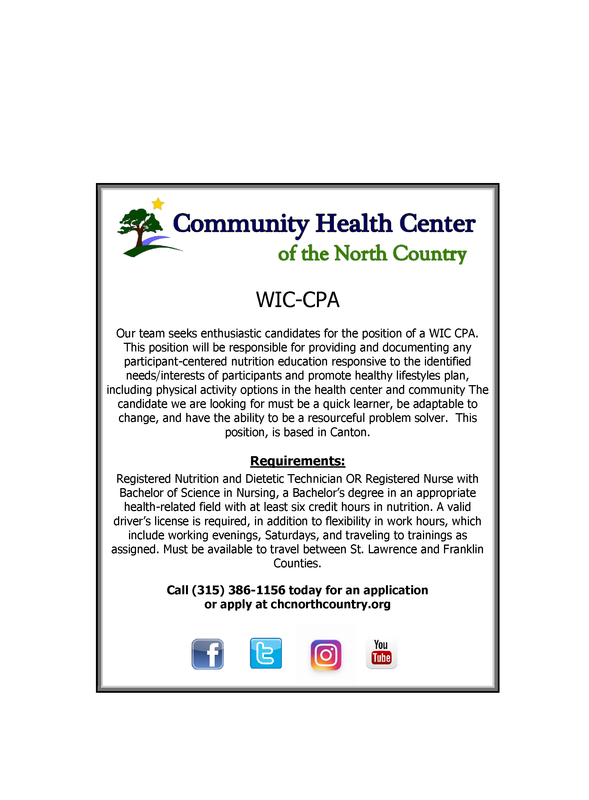 Our team seeks enthusiastic candidates for the position of a WIC CPA. This position will be responsible for providing and documenting any participant-centered nutrition education responsive to the identified needs/interests of participants and promote healthy lifestyles plan, including physical activity options in the health center and community The candidate we are looking for must be a quick learner, be adaptable to change, and have the ability to be a resourceful problem solver. This position, is based in Canton. Registered Nutrition and Dietetic Technician or Registered Nurse with Bachelor of Science in Nursing, a Bachelor's degree in an appropriate health-related field with at least six credit hours in nutrition. A valid driver's license is required, in addition to flexibility in work hours, which include working evenings, Saturdays, and traveling to training's as assigned. Must be available to travel between St. Lawrence and Franklin Counties.